Gutter Helmet® of Indiana has been installing America’s #1 gutter protection system on homes across Northern Indiana and Southeast Illinois since 2003. 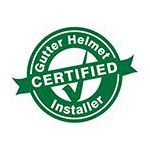 As your local authorized Gutter Helmet® dealer, we are committed to giving you top-quality customer service and the full benefits of the best multi-patented gutter cover available on the market today. Gutter Helmet® of Indiana is part of the Styled-Rite and Trim-A-Seal group of companies. Since 1950, we have been a family owned and operated business founded on the principles of honesty, trust and outstanding customer service. Our employees share our passion for customer care and are fully insured, well trained and very attentive to detail. Please visit our showroom at 7886 Broadway, Merrillville, Indiana 46410 to preview our product selection, including our gutter guard systems, replacement windows, doors, vinyl siding and awnings. For more information or to get a free estimate, please contact our office at (800) 824-3772. You can also fill out our online form to schedule a free in-home assessment.